Ahoy - Mac's Web Log - Opening by Mackenzie Gregory, of the Port Melbourne Historical and Preservation Society Exhibition to remember the visit of the US Great White Fleet to Melbourne. 29th. August/5th. September 1908. 29th. August 2008. Opening by Mackenzie Gregory, of the Port Melbourne Historical and Preservation Society Exhibition to remember the visit of the US Great White Fleet to Melbourne. 29th. August/5th. September 1908. 29th. August 2008. Councillor Janet Cribbes, Mayor City of Port Phillip, your fellow Councillors, members of the Port Melbourne Historical and Preservation Society, Distinguished guests, Ladies and Gentlemen. Thank you for your welcome, I am pleased to be here this afternoon. 100 years ago on this very day, the 29th. of August 1908, Naval history was made here in Melbourne. 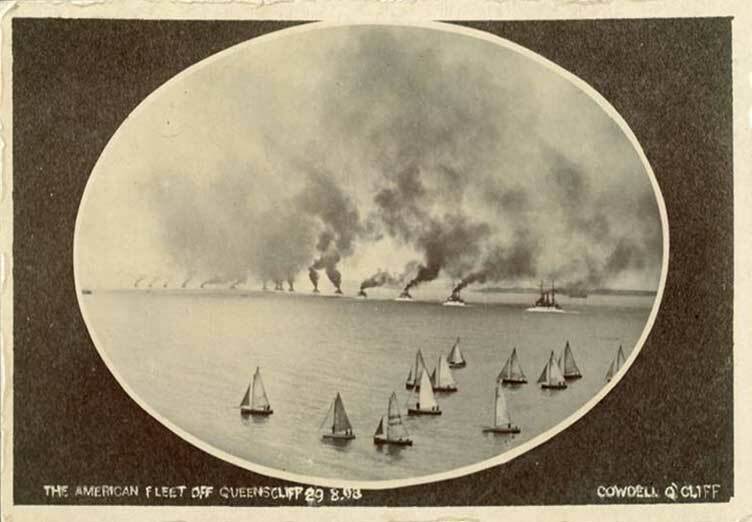 The United States Great White Fleet, so named, as each of the 16 mighty battleships was painted a gleaming white, with gold scroll work on their bows, they sailed in through Port Phillip Heads at 11AM on the morning of August 29, 1908. Australia had never seen a single Battleship, let alone sixteen all at once. They were greeted by large crowds on the foreshore of the Bay, plus a host of small boats escorting them on the 30 mile run up to Williamstown, where they anchored in two lines of 8 ships at about 3 PM, for a 7 day visit. HMAS Cerberus anchored at the mouth of the Yarra River, fired the answering salute to these important visiting Battleships. But why were the Great White Fleet here in Australia, and in Melbourne in particular? The relationship between Japan and the US was at a low ebb in 1907, the Japanese had earlier been victorious against the Chinese on land, and then they decimated the Russian Navy at the Battle of Tsushima in 1905, whilst many in the US believed that their west coast and Hawaii were vulnerable to attack from Japan. The Imperial Japanese Navy was supreme in the Pacific Ocean, a worrying situation for both the US and also here in Australia. President Teddy Roosevelt believed that a show of US Naval strength might deter the Japanese, so he ordered his Atlantic Fleet to show the flag on a world wide cruise. Thus, his Great White Fleet manned by 14,000 Sailors left Hampton Roads on December 16, 1907, to start their journey of 45,000 miles, that lasted till February 22, 1909. With Federation on January 1, 1901, all the States Colonial Navies combined to form the Commonwealth Naval Forces. We find that at this stage, both the British and Australia were working from different agendas. The British Admiralty expected all Australian warships to act as they required to suit the needs of the British Empire, whilst the Australian Prime Minister Alfred Deakin, wanted more independence for the infant Australian Navy, and sought to put Australia's needs and its defence as his primary priority. He pre empted the WW2, Australian Prime Minister, John Curtin, who after the fall of Singapore in 1942, turned his eyes to the East to the United States, for both support and alliance. That alliance is still strong today in 2008, 100 years on. Deakin by passed the Colonial Office in London and contacted President Roosevelt directly to invite his Great White Fleet to visit Australia, he agreed that his ships would visit both Sydney and Melbourne, and finally coal at Albany for the next leg of their world wide journey. The British press went to work with a will, trying to downgrade the importance of the visit to Australia of the US Fleet, and even questioning our loyalty to the Mother Country. We were not expected to be the petulant child, stamping its feet, as we were not getting our own way, Colonials were expected to do as they were told. The Fleet with its 14,000 Sailors took Sydney by storm over August 20/27, now it was the turn of Melbourne to welcome the visiting ships and their crews, and to endeavour to do it even better than Sydney. A Boy's Naval Brigade formed privately in 1903 in Ballarat, had asked the Victorian Government for free rail passes so their members might visit the Great White Fleet, the then Premier Sir Thomas Bent growled " Let them walk ", and that is exactly what 51 boys, including a bugler and a drummer, plus their Officers did. At 9.30 AM on the morning of Tuesday August 25, 1908, the order" QUICK MARCH " was given, and that historic and epic march commenced, it took them all four days to accomplish. Last Monday, I was present in Ballarat to remember the exact time and date 100 years ago that the Naval Brigade left that city bound for Melbourne. The youngest member was Curly Skews, but 9 years old. The Melbourne people raised such a protest about the lack of support from the Government that they were forced to take the Brigade home free by rail. A keen rivalry then existed between both cities that we still find very much in evidence today. Melbourne and its people turned it on for the visitors, and did in fact win the day, we were later voted as the Best Liberty Port in the whole World Tour of the Great White Fleet. Some of the US sailors were so enamoured with the Melbourne ladies, about 154 did not return to their ships, who sailed without them. The list of "Stragglers" provided to the Chief Police Commissioner of Victoria by the US Consul, placed either 10 or 20 pounds upon the heads of those involved, turn in a Straggler to collect your reward. I wonder where the relatives of all who chose to stay in Melbourne are today, what interesting stories are still out there awaiting discovery and telling. Two Sailors died in tragic circumstances here in Melbourne, both on the same day Wednesday 3rd. of September 1908. Arthur Decker, 24, fell asleep on the tracks at Flinders Street station, to be run over by the engine of the Williamstown train backing to couple up its carriages, he died later. The second, Michael Michaelson, 35, trying to jump on a moving train at Flinders' Street Station slipped, fell under the train to be so badly injured, he soon died, both were buried at the Melbourne General Cemetery, so very far from home. I am beholden to Rebecca Spalding for researching at the Public Record Office at North Melbourne to uncover that list of 154 names, and also sharing the details of these two deaths. This visit of the Great White Fleet and its swarm of Sailors was but a pre cursor of the invasion in 1942 of the US Marines. Politically this visit of US Naval might, raised the consciousness of the Australian populace to the need for our own strong Navy, and as a consequence, King George the Vth. granted us the right to add the prefix Royal to Australian Navy, and so, on the 10th. of July 1911, the RAN was born. The Port Melbourne Historical and Preservation Society are to be congratulated for mounting this exhibition to remember the visit of the Great White Fleet 100 years ago, when it was the Town of Port Melbourne who welcomed its visitors, as advancement to the status of the City of Port Melbourne, came later. Thank you all for your attendance here today. I trust this display draws wide support over the next month, and I have great pleasure in declaring this Exhibition, OPEN.